What is your curiosity telling you? Curiosity is many things—a trait, a mindset, and a skill. To wonder about the things you don’t know and to actively fill those gaps with knowledge is to consciously enrich your life. It’s also the secret sauce for creativity. Curiosity silences ego and encourages us to ask why. By constantly asking why we keep the channel open, allowing inspiration, perspectives, and ideas to mold our work and ourselves. The more you practice being curious the more opportunities abound. Sometimes all it takes is tilting your head up and just marveling at this thing called life. This month’s global exploration of Curiosity was chosen by our Malmö chapter and illustrated by Oelwein. Big thanks to our global partners — MailChimp, Adobe, and WordPress.com — for their ongoing support of CreativeMornings We’d also like to thank Greenway Coffee and Tea, Morningstar Donuts, Wild South Tea, Copy.com, and NUU as our local HTown partners. We couldn’t do this without all of you! Black Sheep Agency will be hosting this months event: Parking is available out front and along the street. Carpooling would be a great suggestion as our lot is limited. We are located on the second floor in suite 201. Nick Panzarella is the founder of Houston based Wild South Tea - selling bottled cassina made from wild harvested yaupon holly. His interest in wild and foraged products began while he was obtaining the rank of Eagle Scout in the boy scouts in Kingwood, TX. 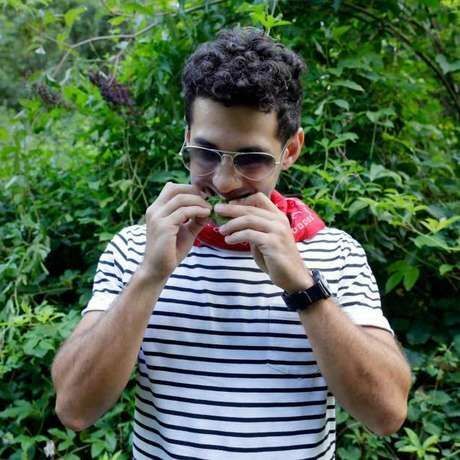 As a linguistics major at Tulane University in New Orleans, he delved deeper into the traditional uses of wild plants by Native Americans and in Cajun culture. Moving back to Houston from New Orleans, Panzarella learned about selling local products as a manager at Revival Market, and began to experiment with brewing a tea from yaupon leaves. He took a year to travel in South America and Europe where he learned first hand how many cultures prized the indigenous products that grew in their regions. Upon his return, while bartending Nick returned to brewing his own batches of cassina from yaupon leaves he was able to harvest in his native Kingwood, and eventually from his uncle’s farm in New Caney, TX. The smooth flavor, natural benefits, and love of tradition gave Nick the motivation to take the leap and create Wild South Tea. A journey which has taken him from figuring out how to brew cassina in his kitchen, to selling loose leaf tea at farmer’s markets, to figuring out how to bottle and stock cassina in stores across Texas. Nick hopes his company can inspire more Americans to see value in the wild and delicious things growing around them. Curiosity can mean “one that arouses interest especially for uncommon or exotic characteristics.” I grew up in an area surrounded by what seemed like an ordinary forest bush, until I realized that it contained caffeine. Pursuing this uncommon characteristic led to research into botanicals, diverse foodways and cultures, and eventually starting Wild South Tea at 24 years old. I use this curiosity to learn every day how to build a national beverage brand, and how to bring new life to native foodways.